Imagine how you would feel if this happened to you or yours: Maria lives in a remote village in the hills of Nicaragua (near Las Salinas, where MOG/WINFOCUS has our Ultrasound Project). The closest hospital or well-staffed clinic is over three hours away in Rivas. Maria and her husband have wanted a baby for a long time and they were delighted when Maria became pregnant. When Maria was six months along, the baby stopped moving and the couple got scared. A local doctor came to her home and examined Maria with his stethoscope – the only tool he had. He told her that the baby was dead and that she needed to get on a bus and take the three hour ride to the Rivas hospital. We have many other testimonies of lives touched and even actually saved. We also thank God for this project. Missions of Grace has partnered with WINFOCUS INTERNATIONAL (www.winfocus.org) since 2011, bringing ultrasound exams to the remote areas of Rivas, Nicaragua. Read more here about Phase Two. In 2014, we were able to reach almost 500 people in need, with a budget of only $3200! That comes out to about $6 per exam! This is incredible, and only possible with the sacrifices of our team, especially nurse Martita Romero. Martita is an amazing individual and she has worked so hard with this Project, even as she continues to run the MINSA (Ministry of Health) health post in Las Salinas. But Martita has bigger dreams, which match our own. We want to empower her to reach them. It is time to expand – we have growing pains! Just think – for only a $30 donation, we can help 5 people, for a $6o donation we reach TEN people and for $90 we can give this gift of an ultrasound exam, peace of mind and follow-up for 15 people!!! What an amazing investment, right? The infant mortality rate is high in Nicaragua – about 20 per 1000 births. Martita is also an educator. The people trust her. Our dream and evolving plan is for Martita to direct her own preventative health center – and expand what we have begun. Host education classes and seminars for safe pregnancy, family life, healthy diet and more. We will have a dormitory where the people from the remote villages and volunteers can sleep. Have an herbal medicinal garden on site and integrate this with the pharmaceuticals at the MINSA health post. We will be working hand in hand with MINSA always. Have an ultrasound technician volunteer rotation, where technicians can come from the U.S. and other places for a time and serve. Build a permanent home for our Mission on the donated land we will receive from Aproden – the Indigenous People of Nicaragua Organization. STRANDS will aid in locally sourcing materials and making the building eco-friendly. The Indigenous Community is donating a piece of land for us to build a permanent building – we hope to sign the papers when Cheri goes to Nicaragua in February, 2015. We will move into a super low-cost building while we build. Establish a micro-business in Las Salinas to help defray the daily expenses, in partnership with the Indigenous Community leaders. Obtain our International Status with the Nicaraguan government. Train and equip assistant for Martita – secure monthly wages. Create Operations Manual and obtain better Local MINSA oversight for our Ultrasound Exams Procedures. Update our machines and inventory. 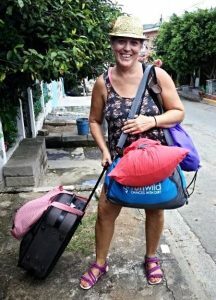 Cheri Mauldin (MOG Director) will be traveling to Nicaragua in February 2015 to help set the stage for the next phase of our project, aided by Sarah Mauldin de Baldovinos in her role as MOG Nicaraguan Director and Martita Romero as Project Director. Please know we are firm believers of forced growth and low overhead. I believe we have proved ourselves over the last couple of years. It is time. Time for the harvest of all the sacrifice and labor by so many who have helped us get to this point. The budget for the First Priorities of 2015 is $8800 – which includes wages for Nicaraguan staff for six months. We are praying and working toward obtaining at least $3000 before the end of 2014. Will you please consider writing a check today or doing an online donation We will be glad to provide a tax-deductible receipt and a small surprise gift from Nicaragua, which Cheri will bring back for you from Nicaragua. Our donors also become part of our team, and we pledge to keep you involved and updated of our progress so that you can be aware of the incredible good things that happen because of your generosity. Thank you for your consideration, and we wish you and yours a very happy holiday season. P.S. If we can achieve serving 500 people with only $3200, just think what we can do with $10,000! For only $30, we can serve five people who have no other recourse. You can have a lasting impact on others’ lives with a small gift today. We also are praying for people who desire to give monthly support to our project. And of course, a one-time gift will be treated with care and so very appreciated. All you have to do is click this link to Donate Now. This entry was posted in MOG Update, Ultrasound project by Cheri Mauldin. Bookmark the permalink.